I am a marine ecology consultant with extensive training and experience in tropical marine ecosystems. Originally half Swiss and half Italian, and having grown up between Europe and the Middle East, I completed a PhD in coral reef ecology at James Cook University in 2004. My fieldwork has taken me to the Great Barrier Reef and Papua New Guinea, and to remote reefs of northwest WA, the Coral Sea and Tuvalu. For the last nine years I have worked as a consultant for government, non-governmental organisations, industry, education and research institutions on diverse projects requiring field surveys, monitoring programs, data analysis, reporting, teaching, literature reviews and management recommendations. 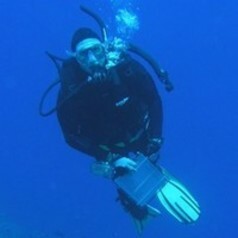 My research and review projects have included studies on coral reef fish and invertebrates, seagrass beds and mangroves, and have required a good understanding of topics such as commercial shipping impacts, the effects of marine debris, the importance of apex predators, and the physical and biological attributes of large marine regions such as the Coral Sea. I also continue to collaborate with colleagues in academic institutions to further my research interests on coral reefs. In my personal life, I spend my time parenting three teenage boys, practicing and teaching yoga, and indulging in music and art.